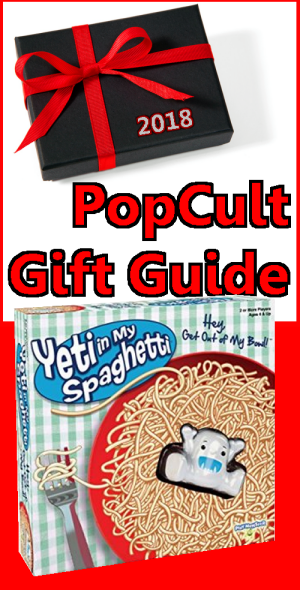 Next up in the 2018 PopCult Gift Guide is a fun gift that’s great for kids, or for an entire family. 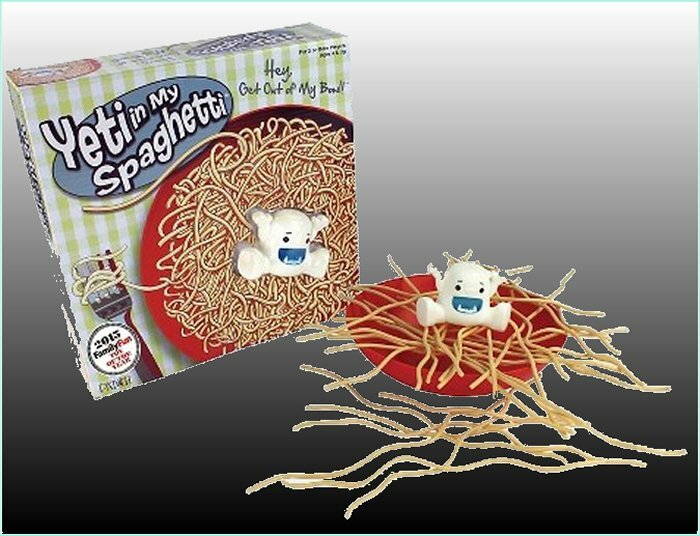 Yeti In My Spaghetti is a fun, silly game that can occupy your time for hours on end as your family members try to master the art of Yeti-Spaghetti Zen. We reviewed this game earlier in the year, and couldn’t think of a better kid-friendly gift at a low price. Yeti In My Spaghetti is recommended for ages four and up, but it’s got an addictive quality that makes it hard to resist at any age. The premise is simple. Inside the box you find a bowl, thirty pieces of plastic “spaghetti,” and a little plastic Yeti. You’ll also find the rules in English and Spanish. They aren’t very complicated. You lay the “spaghetti” across the bowl, building a platform on which you place the Yeti. Then the players take turns pulling out the “spaghetti” strands, one by one, until the Yeti falls into the bowl. It’s sort of like a cross between pick-up sticks and Jenga, with the added ingredient of snow monsters and pasta. In a two-player game, the person who pulls out the spaghetti strand that makes the Yeti falls is the loser. With more than two players, the winner is the one with the most spaghetti. It’s simple. It’s goofy…and it’s a lot of fun. This is not a game that requires a lot of brain power. There is skill involved, but it’s not like you’re going to have to “phone a friend” or anything. Yeti In My Spaghetti is a great throwback to the goofy, fun games of my youth, and you ought to be able to find it anywhere that games are sold. Some retailers have it for under ten bucks now.